As ABACE 2019 prepared to launch, NBAA president and CEO Ed Bolen gave the assembled international media an overview of what they can expect at this year’s show. The event began today with the opening session. “Every year at ABACE we have an opportunity to bring together leaders in government and leaders in industry to discuss how business aviation and general aviation can create jobs and economic development, bring countries and cultures closer together, and in times of need provide humanitarian assistance,” said Bolen. “This year I’m very proud because we are bringing together perhaps the most remarkable and prestigious lineup of local, national, and international leaders we have ever had.” Among the keynote speakers are Jiang Chunshui, party secretary of the East China Regional Administration for the Civil Aviation Administration of China (CAAC); Cai Jun, inspector of the Shanghai Traffic Commission; Yun Qin, chairman of Shanghai Airport Authority; Xin Feng, president of the Shanghai Airport Authority; U.S. consul general Sean Stein; and Weldon Epp, consul general of Canada. 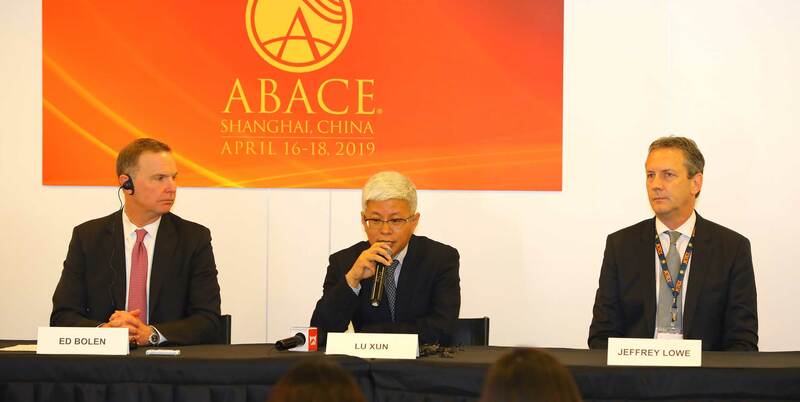 For the first time in ABACE history, the keynote session features a panel discussion between aircraft manufacturers operating in China, moderated by AsBAA chairperson Jenny Lau. It includes Guangshan Lu, chief engineer of Aviation Industry Corporation of China (Avic), Kevin Wu, Textron Aviation’s international vice president of sales for Greater China and Mongolia, and Todd Simmons, president of customer experience at Avic-owned Cirrus Aircraft. The opening day of the show also features a symposium held by the CAAC that includes leaders with expertise in airports and airspace to discuss ways to improve and enhance infrastructure in China and Asia. As is customary, the last day of the show, April 18, will be student "Discovery" day, led by AsBAA, and will be expanded this year to include students not only from Shanghai but also from Beijing and Guangzhou. “We will hopefully capture their imagination and inspire them to dedicate their careers to this exciting industry that we so proudly call business aviation,” said Bolen. Aircraft manufacturers continue to use the show’s static park to display their latest and greatest aircraft, and he noted that Bombardier chose the venue for the international show debut of its new flagship Global 7500, one of the more than 30 aircraft across all segments of general aviation that are on display this year. Lu Xun from the Shanghai Airport Authority noted that while the past growth at the city’s airports had been rapid, the focus now is on quality rather than quantity. He said that the authority put forward its new master plan with an emphasis on quality growth. The city last year set records in terms of takeoffs and passenger numbers transiting Shanghai although, at the same time, business jet traffic declined by 4.5 percent year-over-year. Yet Lu believes the Chinese market is becoming more open to business aviation, based on reforms that are being implemented, and these changes will bring new opportunities in the sector. Jeffrey Lowe, managing director of industry data provider Asian Sky Group, noted that while optimism among the business aviation industry in China plummeted over the past year from a high of 88 percent to a low of 41 percent—a level not seen since the first quarter of 2016—positive sentiment began to rebound through the first quarter of the year. Though China saw a business jet growth rate of 10 percent in 2017, last year it saw a 2 percent decline. The country continues to experience strong growth in the helicopter segment, however, posting double-digit growth for the second straight year. Overall, the entire Asia-Pacific region saw a slight increase in the jet fleet year-over-year, while gaining nearly 200 helicopters, said Lowe.